I like to take pictures. LOTS of pictures. I should probably look into that instagram thing...but unfortunately my phone is a dinosaur with no camera so it really wouldn't do me any good. Maybe someday. Anyway, generally when I make a quilt, I take lots of pictures of it. Like 200...or more. Just in case. Sometimes I do 4 or 5 different photo shoots if I need to. This is probably because I was a (not very skilled) photo major for one year in college and learned very quickly that I needed lots of angles and exposures to choose from. And it allows me to have a few sweet pictures for my yearly calendar. (You can see the old calendars here). I almost lost a couple of the nursery kids while I was staring at it (just kidding). But it's awesome, right? And the perfect color! And the slats around the bed totally remind me of a fruit crate! I knew it would make the most perfect backdrop for the watermelon quilt picture...it was a match made in heaven...or a match made at church anyways! So (after the kids were safely back in the nursery) I marched myself right inside to find out who it belonged to. Luckily, I met the cute girl who owns it and her husband who built the truck himself!! They are the cutest people...and wouldn't you know it...she's a quilter too! It was meant to be! Just sad we only met 3 weeks before I am moving! Anyway, she was nice enough to let me take a few pictures with her truck last week! I am so happy with the way they turned out...and I was feeling like my photography skills totally tanked when we moved out here. I was having such a hard time finding good places to take pictures...well don't worry, I found great places for 2 other quilts while at her house! Yay!!! Thanks Ella! I love the truck. I learned to drive on a truck that wasn't much newer than that one! It is so hard to get good photos of quilts. I am impressed at the quality of your photos. Yes, that is perfect! So cute! Definitely a perfect match. I only wish I had your "tanked" skills! These photos are pretty amazing! I like the last photo because it shows the crate on the truck bed the best, but it has a fairly busy background. The first one really highlights the quilt the most. The second one shows the truck the best. That was no help, was it? Still love your bright and fun quilts! What a perfect photo opportunity! Your quilt is wonderful. 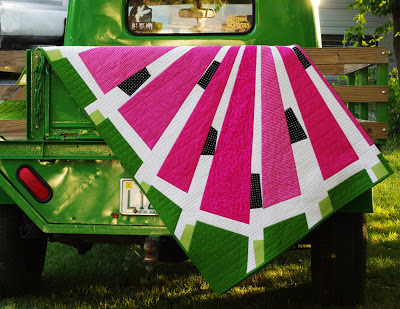 What a perfect match up...and cute idea with the watermelon quilt. That quilt with that truck!! Perfect. Now the hard part, picking your favorite shot! I love that first shot the most! 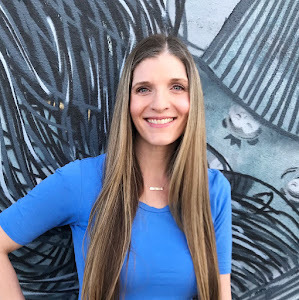 What a fabulous lucky find, Cynthia! This is such a great quilt and it looks so good with that truck! B E A U T I F U L!!! Just so Beautiful! And that quilt is amazing!! Gotta be the last one. Perfection! Great photos - yes finding the right setting/place is a challenge. Looking forward to see your other quilts now too. I was looking for some inspiration this morning and as usual enjoyed perusing your quilts. I enjoy your work immensely. Just letting you know. 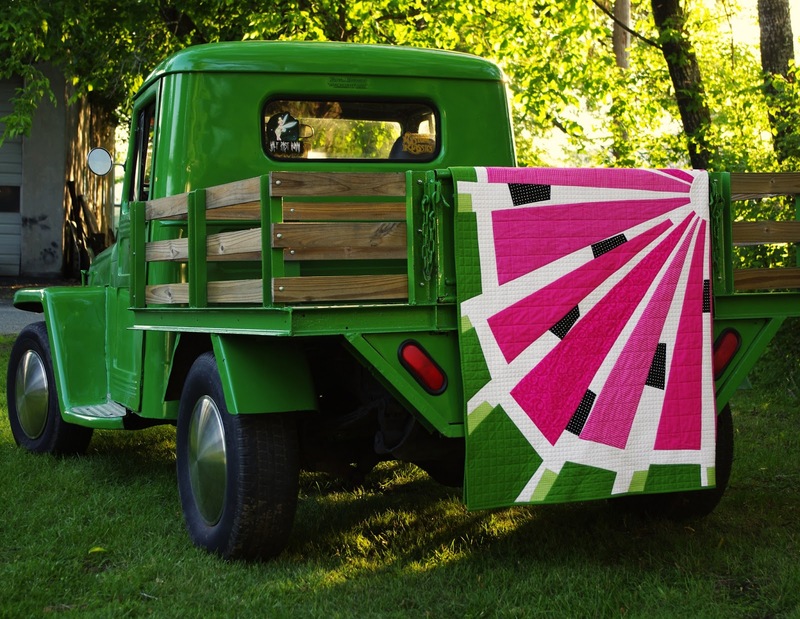 What a perfect backdrop for your watermelon quilt. I love the quilt, it's so creative! You could not have found a more photo opportunity. This quilt and truck were meant for each other. I think this quilt is amazing and I love the fun watermelon pattern. My daughter is addicted to watermelons and would just go crazy for a quilt like this. how fortuitous that you happened on that truck! it makes for great photos with your lovely quilt. Hi - I found you via Sew in Love with Fabric. 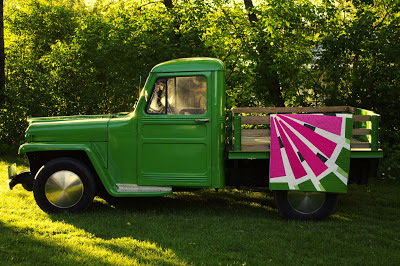 This quilt is beautiful and I love how you photographed it against a vintage truck! Is there a pattern available for this quilt? Love the back of this quilt as much as the front. Amazing creativity in your quilts and your photos. I still think it is awesome! Ive commented it earlier.. I just have to repeat myself! It is B E A U T I F U L!!! I hope you haven't posted because you are enjoying this beautiful summer. I sure miss your posts.